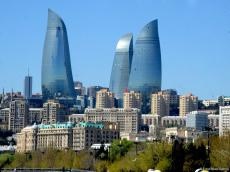 Baku 2020 International Festival of Culture and Arts has been discussed. A press conference dedicated to the festival was held at NUR Art House Gallery, Azertag reported. The first International Festival of Culture and Arts was held in 2017 in Berlin. Its founder was the chairman of the International Association of Culture and Arts of the Peoples of the World Bulat Mekebayev - an artist from Kazakhstan who has been living and working in Germany for many years. The participants were shown a video about the first festival in Berlin. Bulat Mekebayev spoke in detail about the festival participants. He noted that the next festival will be held in Baku on March 11, 2020, bringing together representatives from foreign countries. "We want to showcase Europe the Museum of Miniature Books, acquaint with Azerbaijani carpets, as well as music, literature, visual arts of Azerbaijan, the great cultural wealth of the Azerbaijani people," said Mekebayev.